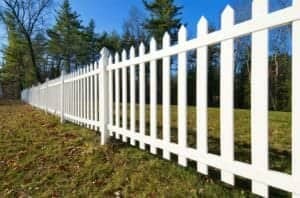 In Temecula and surrounding cities, All Counties Fence and Supply is the trusted source for fencing installation, fencing supplies and other outdoor services. With decades of experience, products from the finest manufacturers and a commitment to customer service, we make it easy to complete the residential or commercial project of your dreams. And reasonable pricing helps you reach your goal without placing a major strain on your budget. Wood Fences – Wood is highly prized as a fencing material. Reasons for its enduring appeal include its organic appearance and its ability to provide both privacy and an increased sense of personal security. 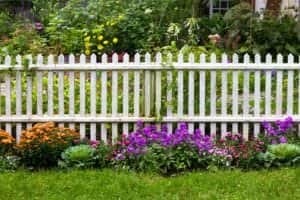 What’s more, a simple maintenance routine can keep a wood fence in top condition for longer than you might expect. All Counties features redwood and cedar products, well-known for their beauty and weather resistance. In addition, we feature Rightwood, a durable composite product that shares some of the most beloved characteristics of natural wood. 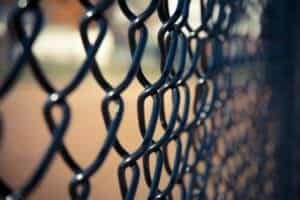 Chain Link Fences – Chain link is renowned for its all-around usefulness as a residential and commercial fencing material. 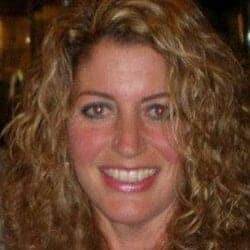 In addition to providing property boundaries and security perimeters, it can be used for purposes that range from the creation of animal housing to the enclosure of tennis or basketball courts. On projects of all sizes, fences made from this material can also help reduce installation and maintenance costs. All chain link fences sold by All Counties come with the added benefit of fire-rated glass embedded throughout. Vinyl Fences – Vinyl was once viewed as an afterthought in the fencing industry, with poor scores for appearance and durability. Times have changed, though, and you can now find products in this category that equal the aesthetic and functional benefits of other materials. And this advance in quality often comes at a relatively low price point. Trusted manufacturer Ply Gem is the featured dealer for our vinyl fencing inventory. The company’s products are subjected to rigorous quality control, and excel in both durability and selection. 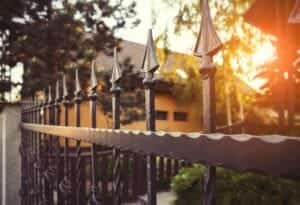 Iron Fences – Tubular metal fencing has long been treasured for its looks and toughness. Traditionally, these fences are made from iron. However, many manufacturers now build their products from galvanized steel. This strong, up-to-date alternative provides the appearance of iron, with the added benefit of being easier to prime, paint and powder coat. At All Counties, all fences in this category are made from the best steel available. We find that long-term savings in maintenance costs help counterbalance any increased expense for initial installation. Specialty Fences – Fencing products sometimes take unusual forms, or fulfill unique purposes. In the industry, these far-ranging products are known collectively as specialty fences. The list of specialty items includes the metal and wood fences used to construct large animal enclosures on farms and ranches. It also includes the glass wall fences and cable fences installed in residences, hotels and office buildings. All Counties stocks an extensive selection of specialty fences for homeowners, business owners, farmers and ranchers. If you like, we can install your chosen product with our customary blend of efficiency and expertise. We can also supply the raw materials for your residential or commercial project. Landscaping – Landscaping jobs are projects that rely on the use of flowering plants, trees and other organic materials to modify, transform or contour an outdoor space. In addition, these projects often call for the installation of some sort of watering and/or drainage system. We’re your local experts for landscaping projects that meet the demands of Southern California’s unique environmental conditions. Our complete list of residential and commercial services includes planning and design, the installation of all primary materials and the installation of all behind-the-scenes water and drain connections. We also provide detailed maintenance advice. In addition, we stock a broad range of accessories that help finalize the look of your project. Wall Construction – The hardscaping category also includes construction of functional and ornamental walls. However, due to the specialized training required to carry out many wall-related projects, this field deserves its own separate category. All Counties relies on deep experience and proven methods to provide exemplary structures for your home or business. We can handle even the most detail-oriented, time-critical projects. Situated in southwest Riverside County, Temecula is a thriving community of roughly 110,000. Although the area has a long history of habitation, the city itself remained unincorporated until 1989. Temecula is well-recognized as a regional hub for Southern California’s resort and tourism industries. Popular attractions and events include the Temecula Valley Balloon & Wine Festival, Old Town Temecula, the Temecula Bluegrass Festival and the Temecula Valley International Film and Music Festival. The area is also home to roughly 40 wineries, as well as multiple golf courses and the Temecula Valley Polo Club. All Counties Fence and Supply serves the residents and businesses of Temecula from our centralized home base in Riverside. Our coverage area also extends to communities throughout Riverside County and San Bernardino County. Whether you need comprehensive installation assistance or a reliable source for fencing, landscaping and hardscaping materials, we’re standing by with the region’s best track record for professionalism and value. That value includes free estimates for your upcoming project, as well as industry-leading labor and materials warranties. Call us today for more information.